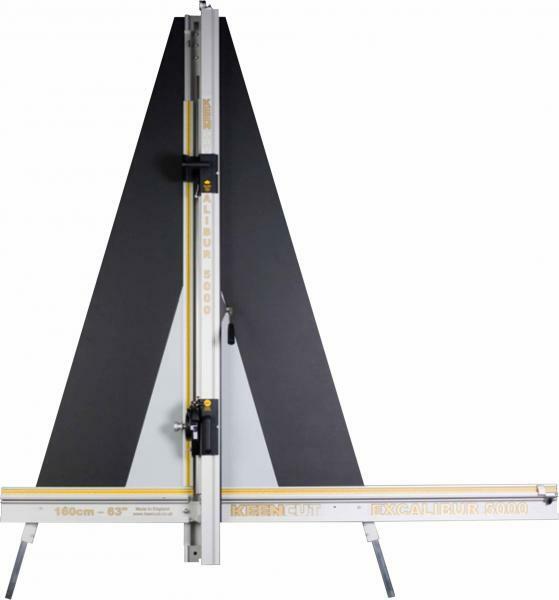 The Excalibur 5000 vertical wall mounted cutter releases valuable floor space. It cuts cleanly and accurately with a strong clamp holding even thick materials firmly. Three cutting tools are located on the first sliding head. These are quickly and easily changed simply by twisting the head, no screws to undo. A patented, twin wheel cutter is found on the second sliding head. This cuts through the thicker materilas such as MDF, hardboard, etc. Hardboard and MDF up to 3mm (0.12") thick. Scores glass up to 6mm (0.24") thick. PVC Foamboard up to 13mm (0.50") thick. For a complete description of the Excalibur 5000 please click here to visit the Keencut website.